Well..... it's been a while, hasn't it? This past winter/spring was one of the most exciting/fun/important learning experiences I've had, and that meant that the time I usually set aside for blogging was a bit harder to find. I did knit while I was in Spain, and I will take (proper) pictures of those projects once it stops being 90 degrees out and the thought of wearing a silk-wool blend infinity scarf doesn't make me want to pass out. But I saved the labels for the yarn AND wrote down the patterns I came up with so this fall expect an update/free patterns. 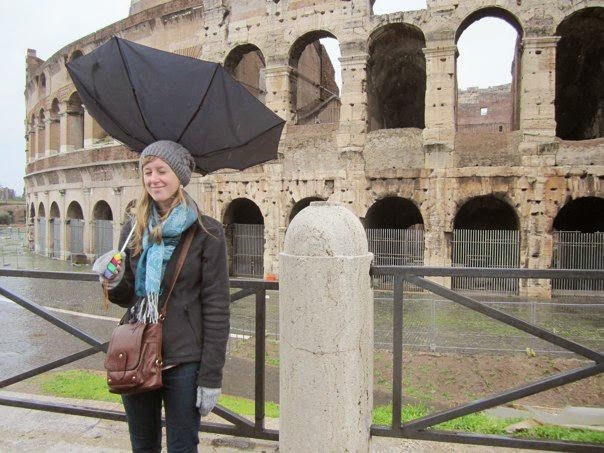 This one is in Rome at the Colosseum where it was VERY windy and VERY rainy and my umbrella just couldn't take it anymore. The hat, however, at least kept my head warm. 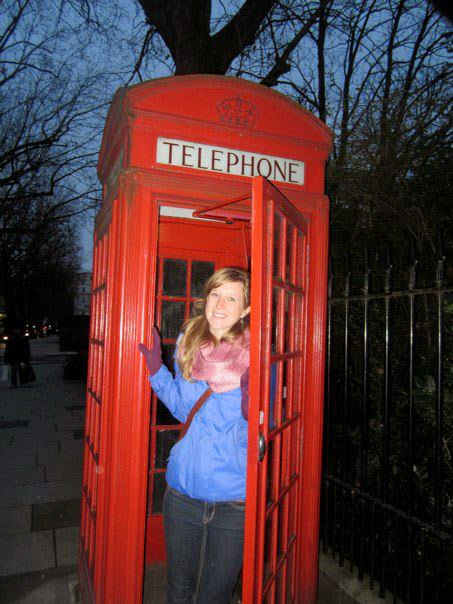 And this one is in London in March (I was very adamant about taking the super-touristy telephone booth picture), which I think may have been the coldest I have ever felt (and a windy Boston in the winter is pretty cold). The scarf was my 'present to myself' scarf because I knit it in a kind of expensive but so soft silk blend. It's super cozy. 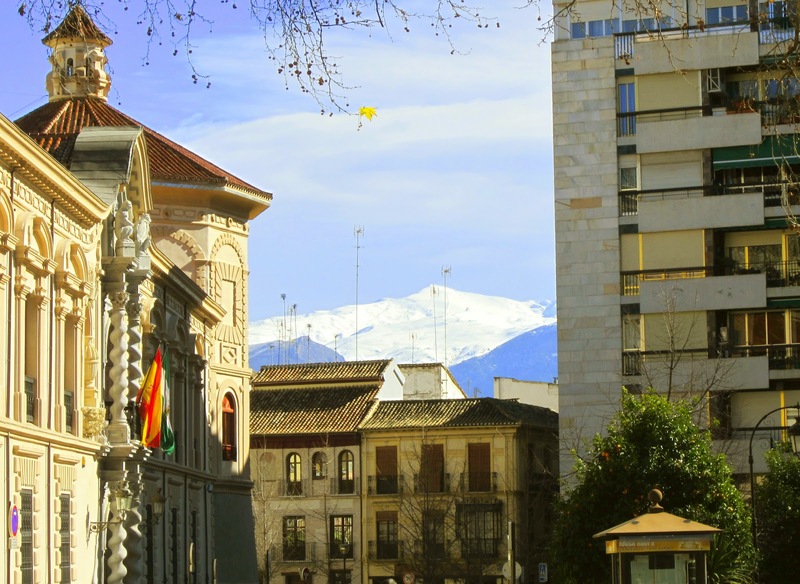 Granada is a beautiful city. I was there for four months and lived with a host family. Living with them and sharing meals not only exponentially improved my Spanish but also really forced me to step out of my comfort zone. Over the past four months I got to visit Madrid, Morocco (specifically Chefchaouen, Assilah, and Tangiers), Rome, London, Paris, Lagos, Portugal and Barcelona. I also did some travelling in the immediate vincity of Granada. As typical study abroad students will say, it was one of the best experiences of my life. If any of you are reading this and have the opportunity to study abroad, I urge you to do it. Coming home I've been looking for ways to take the souvenirs and photos from the last four months and turn them into something that I can look at or hang up or something. My first project was to use my map of Spain, cut it up, and paste it to canvases but I'll explain that in it's own post later. More recently, I forced myself to pick only one or two of my favorite photos from each place I visited or that meant something to me. I ended up with 16 so I went and bought 16 of those flat magnet frames and developed the photos. Once I get back to school, I plan on attaching them to the wall in a grid, that way I can look at all my favorite places at once. I took this photo on my walk back to my host family's apartment after class. One thing I loved about Granada is you had snow-capped mountains in one view, then palm trees in another. This is the Alhambra and it is the main attraction to Granada. It's an old Muslim palace and is not only beautiful on the inside but it is surrounded by beautiful gardens. I took this from the Mirador which is a look-out point in the district of Granada knows as the Albaycín. The closest beach was about a 40 minute bus ride away. My friends and I went a little bit further to a beach town called Almuñecar. This was my favorite beach that we found. I even travelled back there in the rain before I left so I could get a jar of black sand. This is El Torcal which my study abroad program had us stop at on our way to Cadíz. Everyone kept talking about how they were 'dinosaur' rocks, which is basically true because they have been here since the dinosaurs. They are limestone and years of erosion have caused them to look this way. This is the sunset in the beach city of Cadíz. It was one of the best sunsets I've seen. To say I freaked out when I saw the Trevi fountain in Rome would be pretty accurate. One thing that happend to me multiple times is we would be kind of lost trying to find something, would turn a corner (and in this case hear the running water) and BOOM historical monument. We went at night (and by night I mean around 1AM) which meant we had plenty of room to make wishes. We went to the Spanish Steps during that time as well and basically were the only ones there. This is in Chefchaouen, Morocco where all the buildings are painted blue to keep the bugs away. There were so many beautiful alleyways where you'd look down and it would be like a tunnel of blue. This is the Cave of Hercules in Morocco. I literally shed a few tears when I got to the Harry Potter Studio in Leavesden, just outside of London. 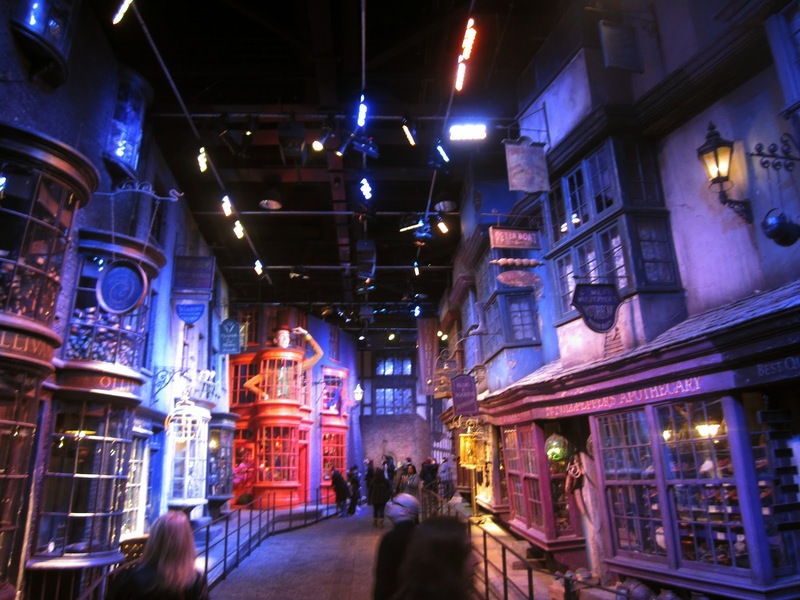 This is the set of Diagon Alley. Big Ben and Parliament were just as cool as thought they were going to be. I loved London and I hope to go back there soon. The Eiffel Tower and the Trevi Fountain were the two big-time historical monuments that exceeded any expectations I had. It was absolutely beautiful. My friends and I bought wine, bread and cheese for dinner and sat for while just watching it. Something that was a surprise to me (and I probably should have known this) is that it sparkles every 10 minutes after 8PM. Lagos, Portugal was a much-needed relaxing trip after so many let's-see-as-much-as-we-can trips. I spent most of my time napping on the beach. The program I went to Lagos with took us to what was once considered the 'end of the world' in Cape Bojador to watch the sunset. My friends and I often debated at which attractions it was worth it to pay to go inside. With the Sagrada Familia in Barcelona, it was ABSOLUTELY necessary. I saw a lot of Cathedrals while in Europe, but the Sagrada Familia is something else entirely. It's not even finished yet but I just found myself looking up with my mouth hanging open. The stained glass makes it so colorful inside and the columns (matching the intent of Gaudi, the architect) look like trees. This is on the plane as we flew out of Barcelona. Clouds! It's been an adjustment being back home, but I was happy to see my family and friends again and I will be happy to return to Boston in about a month. In the meantime, I'll keep knitting. Keep an eye out for more craft tutorials, too!